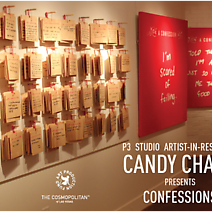 Candy Chang is an artist interested in public spaces and personal well-being. She is a TED Senior Fellow, a Tulane Urban Innovation Fellow, a World Economic Forum Young Global Leader, and was named a “Live Your Best Life” Local Hero by Oprah Magazine. By combining street art with sharing and reflection, she has been recognized for exploring ways our cities can become more contemplative. She received a BS in Architecture, a BFA in Graphic Design, and a Masters in Urban Planning from Columbia University. Once a designer at The New York Times, she went on to collaborate with community groups to make citizens’ rights and resources more accessible. Projects included the award-winning Street Vendor Guide in New York City. After working with community groups in New York, Nairobi, New Orleans, Vancouver, and Johannesburg, she began to question the limitations we have in sharing wisdom and resources with our entire neighborhood. Her questions turned into small experiments in public space to share more with her neighbors, often using simple tools like stickers, stencils, and chalk. After losing someone she loved very much, she’s become consumed by what it means to lead a fulfilling life. She created Before I Die on an abandoned house in her neighborhood in New Orleans for people to reflect on their lives and share their personal aspirations in public space. The Atlantic called it “one of the most creative community projects ever,” and thanks to passionate people around the world, walls have been created in Kazakhstan, South Africa, Portugal, Russia, Italy, Australia, Argentina, and beyond. She is the cofounder of creative studio Civic Center. Her work has been exhibited in the Smithsonian Cooper-Hewitt National Design Museum and the Southbank Centre, and she has created public art commissions for civic institutions, international airports, and creative organizations. She speaks internationally and has received grants from the Rockefeller Foundation, the Black Rock Arts Foundation, and the European Capital of Culture. Her parents immigrated from Taiwan to the United States and she was born in Pittsburgh. After years in New York City and Helsinki, she now lives in and is in love with New Orleans. She is currently working on projects about sanctuaries, deep time, and pilgrimages.